The business layer is the nucleus of any application created with StrataFrame. It houses all business logic and provides the coupling between the data access and the user interface. Special attention was given to the business layer to ensure it could be easily bound to controls and provide straightforward programmatic access. The middle layer of an application created using StrataFrame consists of one or more business objects that inherit from the abstract BusinessLayer class. This class provides base functionality for all tasks, including business object population, business rules handling, validation, data retrieval, and data navigation. StrataFrame has no proprietary or scripting languages that must be learned. All logic can be completely coded in any managed .NET language, including VB.NET and C#. This increases the speed of development and allows business logic to be reusable. StrataFrame provides the ability to strong-type the business object column properties easily and quickly using the Business Object Mapper. Properties are created on each business object and reflect the actual data columns of the represented structure. Since the field properties are strong-typed, code reliability improves. The foremost reason for this is that almost all data type mismatches can be resolved at compile-time rather than emerging at run-time. Using a strong typed field in a manner inconsistent with its data type will produce a compiler error, while using a weak typed field in the same scenario will not. There are many instances in which a column in a database represents a type other than what is stored as raw data. For example, a column in a table may be typed as INT, but when the developer interacts with the field property on the business object, he or she needs the ability to have it typed as an enumeration and to have the value automatically persisted back to the database as INT. In another example, a data column may be typed as VARBINARY or IMAGE but actually represent a bitmap or serialized object; StrataFrame allows the field property on the business object to be strong typed as the serialized object type and will automatically serialize and deserialize the data to and from the database without writing a single line of code. The business layer of StrataFrame contains features that alleviate many of the mundane tasks that normally plague application development. These features allow the developer to focus on the specifics of the application rather than investing time in the creation and maintenance of baseline functionality. StrataFrame natively supports compound primary keys within table structures. This support is extended to all navigation and query methods within a business object and is ready for use out-of-the-box. A .NET ErrorProvider is utilized to display errors and broken business rules to the end-user. The implementation of the error provider requires no code from the developer and its appearance can be extensively customized through properties including the ability to disable the error provider completely. Relationships are configured on a per-class basis for business objects within a StrataFrame application's business layer. Once configured, the BusinessLayer class will automatically manage the primary key/foreign key relationship; new child rows will be assigned the foreign key value of the primary key from the corresponding business object. When new records are saved, the primary key value the database server assigns is propagated through the relationships to the child business objects. The management of the relationship is also used to ensure new parent records are saved before the corresponding child records are saved. By default, all fields on a new record are initialized by data type to prevent any run-time DBNull errors. This feature can be disabled by setting a single property. Additionally, all business objects can be given an initialization priority which allows the developer to control the order in which objects on a form are initialized. The BusinessLayer class follows best the practices for object-oriented programming and utilizes many established design patterns. 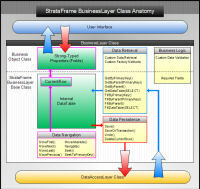 Only a single class is created for each business object in a StrataFrame application. By inheriting from the BusinessLayer base class, business objects enjoy all of the necessary functionality mentioned in the overview. This tightly integrated and cohesive single-class design is of high significance to the developer because it greatly improves the simplicity of the application when compared to the 5 to 7 classes per business object typically required by other commercial framework options. The business layer has been optimized to deliver a high level of performance for the application developer. A DataTable, rather than a DataSet, is used within the business object in order to reduce the memory footprint of each instance of a business object. Custom data navigation has been implemented to allow the developer to iterate through the records within a business object (sorted or unsorted, filtered or unfiltered) more rapidly than iterating through the entities within a custom entity collection. All business logic is housed within its corresponding business object class. Additional classes are not required for business rules, data validation, default values, etc. Required fields are implemented by the BusinessLayer base class and do not necessitate any code from the developer. This centralization simplifies the developer's coding process and improves performance by keeping class instantiations and server round trips (to check server-side logic) to a minimum. Though the required field logic can be manually programmed, StrataFrame provides a quick and easy way to specify fields that require entry by simply clicking a check box. Every business object contains a collection aptly named RequiredFields. Through the component designer within Visual Studio, the fields that require entry can be set using the integrated type editor. All areas of StrataFrame are localizable, including the business logic. Instead of hard-coding broken rule messages within the code, they can be pulled from a localization database through the extensive Messaging and Localization support. In concert with the other elements of the StrataFrame Application Framework, the business layer is designed to empower developers, not limit them. 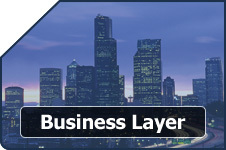 The BusinessLayer class provides a great deal of flexibility and functionality that can be overridden or modified. Moreover, strategic properties are exposed, which enables the developer to toggle much of the automation within the business objects. Field properties created by the Business Object Mapper can be customized or replaced by custom code that the developer provides. Whether used programmatically or configured for data-binding to controls, StrataFrame business objects are designed for ease-of-use. With the strong typed fields on a business object, all of the field properties are available within the Intellisense supplied by the code editor within Visual Studio. You will never need to look at a reference chart to check the names of your fields again. Programmatic access is further enhanced by the base class methods that can be used to seek, filter, navigate, iterate, or sort records within the business object. Many event driven hooks are intrisically provided to give the developer complete control when interacting with the business objects. There are a wide range of events that exist providing the developer with complete control. This methodology allows a much more precise interaction with the environment and prevents the need for method overrides. The hooks include such events as before, after, security, state change, error, concurrency, data change notifications, new record default value initialization, and more. Changing the CurrentRow of the businesss object is made easy through functionality provided by the BusinessLayer base class. When invoked the data navigation methods will modify the CurrentRowIndex and change the row accessed by the actual strong-typed field properties. Support for ADO Style, FoxPro, and UI Bound navigation exists with such methods as: MoveFirst(), MoveNext(), MovePrevious(), MoveLast(), MoveAbsolute(), Seek(), SeekToPrimaryKey(), Navigate(), and NavigateToPrimaryKey(). The data within the business object can be sorted or filtered easily by the developer. Optionally, the current filter can be propagated to child business objects. Though StrataFrame manages all of the necessary tasks required for robust application development there are times when direct access is required by a developer. When such situations arise, the ADO.NET components are directly accessible through exposed properties on the busines objects. This includes properties such as: CurrentDataTable, CurrentView, CurrentRow, and CurrentRowIndex. When the need arises to direclty interact with the broken rules, a collection exists on all business objects that allow the developer to manipulate and display the broken rules as desired. All business object have the ability to natively support grids through the exposed ADO.NET properties. Grid support provides native event interaction allowing the developer to monitor the navigation events without adding any code. Also, most any third party control can easily interface to the business through binding support options made available in StrataFrame. At times, it is necessary to use an XML file as a data store. When this need arises, a business object can be strong typed and read from and write to an XML file. Additionally, this XML file can be dynamically encrypted and decrypted by calling a single method. Business objects have complete serialization support. This allows a business object to be save and restored to disk in its complete state. Moreover, a business object can be serialized to and from a stream allowing a business object to be handed out from a single location passed through a network connection. This provides support for enterprise services, remoting, and web services. Properties are created on each business object and reflect the actual field values of the internal data table. The properties are populated as a byproduct of the framework’s navigation methods. This simplifies access to the simple mybo.myfield vernacular, totally alleviating the requirement of indexes being passed. Changing the CurrentRow of the businesss object is made easy through functionality provided by the BusinessLayer base class. When invoked the data navigation methods will modify the CurrentRowIndex and change the row accessed by the actual field properties. All ADO.NET components used within the business object are exposed for developer interaction. CurrentRow -– The DataRow currently used by the field properties on the business object. This row is determined by the CurrentRowIndex of the CurrentDataView. CurrentDataTable -– The internal DataTable of the business object that houses all data. CurrentDataView -– The DefaultView of the internal data table that allows the business object to be sorted and filtered. Hooks are provided for the developer to extend the functionality of the business objects. CheckSecurity -- raised when a business object attempts to add, edit, delete, or save a record, allowing the developer to determine if the user has the required privileges. CheckFieldSecurity -- raised when the business object is configured to check field level security and allows the developer to block specific fields from being viewed by the end-user. The strong-typed field properties on each business object are created and maintained through the Business Object Mapper. The Business Object Mapper directly integrates with Visual Studio and allowing it to modify the files from within the IDE. The field properties are stored in the partial class file used by the component designer. Field properties are not limited to the primitive data types, but each can be assigned a custom data type. Common custom data types include enumerations that allowing the business object to return the typed enumeration but still store it in the database as an integer type. Field properties can also be complex, serializable data types. When configured, a field property will serialize and de-serialize an object into and out of a field property, storing it in the database as a binary field type. For example, a bitmap image could be serialized when it resides on disk then de-serialized for use on the presentation layer; a System.Drawing.Bitmap object would be returned by the field property rather than a Byte. The developer is not required to maintain a collection of UML, XSD, or XML files to define the field mappings for each business object. The Business Object Mapper can use either the data source or the meta-data within the Database Deployment Toolkit to derive the schema for the business object. A hook event is provided to check business rules. All business rules logic is placed within the handler of this event. It is raised from within the BusinessLayer base class when the business object is saved. It is also raised if the developer explicitly calls a rules check. 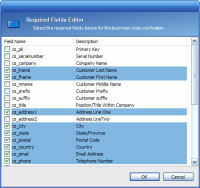 A required-fields collection is implemented through the BusinessLayer base class and each required field is actually selected via a simple to use editor. These required fields are checked when the business rules are checked, and broken rules are automatically added to the broken rules collection for each required field not entered. When business rules are checked, broken rules are added to the business object. The most recent collection of broken rules is available to the developer through the BusinessLayer base class. A .NET ErrorProvider is utilized to display errors and broken business rules to the end-user. The implementation of the error provider requires no code from the developer and can be toggled. Many application frameworks implement their own scripting language that is used to program business rules. With StrataFrame, the developer does not have to learn a new scripting language to check the business rules as all business logic is programmed in the .NET language used to create the business object. While the developer can use any combination of server-side and client-side logic to check business rules, StrataFrame does not require any server-side code. Many business rules require a database query or a file system check; this is possible, as all business rules are coded within .NET rather than T-SQL or a proprietary scripting language. Each business object contains an internal instance of the DataAccessLayer class. This object provides the interface between the business object and the data store. The BusinessLayer base class provides several protected methods for the developer to interface with the data access layer. Note: The retrieval methods do not interrupt the actual business object (internal data table). The newly fetched data is autonomous and does not interfere with any existing process of the current business object. Factory Methods -– Constructors are provided by the BusinessLayer base class that allows the developer to implement custom factories or shared factory methods directly on the business object class. The BusinessLayer base class manages relationships by synchronizing primary key values with corresponding foreign key values. The relationships are configured at the class level of each business object. If a relationship is defined on a child business object and the child tries to save while the parent business object is still "dirty," the child business object will force the parent business object to save. This allows the new primary key values assigned to the parent business object by the data store to be propagated to the child business object before it is saved. A business object can be configured to automatically filter records on child business objects so that only records that correspond to the parent records are visible within the child.